Do you know the number one reason why home water heaters fail over time? It’s because so many of them are left to run without routine maintenance. When a residential water heater is left to operate without constant maintenance, many performance issues can start to crop up. By getting ahead of potential water heater failures before they result in costly repairs, you’ll be doing both your home and your pocketbook a favor. Considering that the average cost for a residential water heater is in the $1,500 – $5,000 range, it’s worth paying some extra-special attention to the routine maintenance that is recommended by your water heater manufacturer. 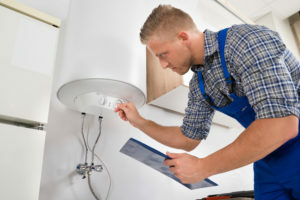 Regardless of the size, shape, or style of your home, or the brand of water heater you’re using, the professional technicians at Front Range HVAC can perform all of the maintenance needed to keep your water heater in tip-top operating shape. HVAC, we take care to ensure that the most commonly overlooked aspects of water heater maintenance are attended to, giving you peace of mind in knowing your water heater is functioning optimally. Heating element test. The heating element test is crucial to ensuring that whatever heating element is being used to heat your water – be it gas or electric – it is in good condition. Water retention test. How well is the water heater transferring water from within it to other areas of the home? Is the operating pressure within the manufacturer’s guidelines? We’ll check to be sure of everything. Electrical performance test. Many water heaters rely on electrical thermostats to maintain the ideal water temperature. We’ll check to ensure that yours is calibrated correctly. Efficiency test. It’s common for older water heaters to start losing out in the area of efficiency even before complete failure. We’ll check to see if this is happening to your unit. Because of our comprehensive, solutions-oriented approach to service, Front Range HVAC is the best source for expert water heater maintenance. When you’re ready to schedule your residential water heater maintenance call, contact us at (303) 942-1372. We look forward to hearing from you!